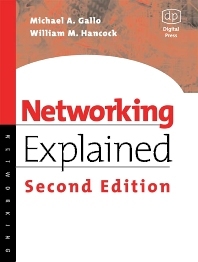 Networking Explained 2e offers a comprehensive overview of computer networking, with new chapters and sections to cover the latest developments in the field, including voice and data wireless networking, multimedia networking, and network convergence. Gallo and Hancock provide a sophisticated introduction to their subject in a clear, readable format. These two top networking experts answer hundreds of questions about hardware, software, standards, and future directions in network technology. William M. Hancock, PhD, CISSP, CISM, is VP of Security and Chief Security Officer of Cable & Wireless, one of the largest telecom and hosting companies in the world. He has over 30 years of experience in networking, security and related technologies and is the author of many books and articles on security, networking and technology strategy. VP of Security and Chief Security Officer, Cable & Wireless, one of the largest telecom and hosting companies in the world.